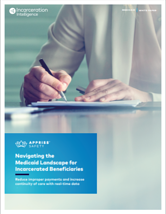 Monitoring incarceration status of Medicaid beneficiaries is a slow and tedious task. But it’s critical to improving continuity of care, decreasing recidivism rates, and combating $60 billion in annual Medicaid fraud. Fortunately, there are straightforward and proven data strategies to help navigate these challenging waters. How Medicaid coverage among incarcerated individuals differs from state to state. How one state Medicaid agency is projecting more than $7 million in savings over the next two years.